There’s a lot to be said for shopping online. The Internet is basically the biggest shopping mall the world has ever seen, with every product you could ever imagine available for sale – and it’s open round the clock. You can compare prices easily, search for coupon codes, and have your purchases delivered straight to your door, all without having to leave your own living room. And for many products, you can find much better prices online, as well. However, there are some products that experts say just aren’t worth buying online – no matter how good the price. Some of these are big-ticket items, such as furniture and appliances, that aren’t worth the risk of buying without the chance to see them in person. But even some small items, such as fresh food and makeup, make more sense to buy in a store. That means giving up the convenience of shopping in your pajamas, but it’s worth it to be more confident you’re getting a good deal. There are three major problems with shopping online. First of all, you can’t see or feel the merchandise up close before you buy. For some products, such as books, that’s not a big deal; a picture on the screen gives you all the information you need. But for other products – such as a pair of shoes that need to fit just so, or a pillow that has to match your wallpaper exactly – it’s a deal breaker. The second big downside of online shopping is the shipping costs. Again, for some items, this is no big deal. A lightweight package doesn’t cost that much to ship, and many sites even offer free shipping if your purchase is over a certain dollar amount. But really big items, such as furniture, come with really big shipping fees – and if you end up returning your purchase, you have to pay them twice. Finally, there are some products that are actually cheaper to buy in-store. Usually, online prices are lower because it’s cheaper to run a website than a brick-and-mortar store, and businesses pass those savings on to their customers. But in a few cases, there are special factors – like the ability to use coupons or negotiate with salespeople – that make in-store prices a better deal. Here are eight examples of products that shopping experts say you should definitely avoid buying online. Color Match. Try this experiment: Use your phone to snap a photo of a picture hanging on your wall, then compare the image on the screen to the original. Chances are, you’ll find that the colors in the photo – even if it’s a really high-quality photo – don’t look exactly the same as the original. If you tried to buy that same painting based on a picture of it in an online marketplace, you wouldn’t be able to tell exactly what it would look like in person or how well its colors would match those in your room. The same goes for colorful decor items, such as paint, pillows, or curtains. If you find a really unbeatable deal on this kind of home accent online, at least try to find it in a store first so you can see it up close. Then you can go home and click the “buy” button with confidence. Check Out Details. Color isn’t the only quality that doesn’t always come through in a photo. If you’re buying a set of curtains or a decorative pillow, you can’t judge the quality of the fabric or the sturdiness of the construction without handling the goods in person. Likewise, with scented products like candles or soaps, you can’t really judge the fragrance without smelling it for yourself. A product described as “a tropical soufflé of green tea, coconut, and lime” may sound delicious, but when you actually get a whiff of it, it might smell more like a musty basement with a dash of vinegar. Discover New Products. If you’re looking for, say, a lamp, it’s convenient to be able to click through to Amazon or Overstock and have thousands of styles at your fingertips. However, if you narrow down your choices on the screen – selecting exactly what you think you want for size, style, color, shape, and so on – you’ll miss out on seeing a lot of other models that you might actually like better if you had a chance to look at them. Browsing through a store is a much more relaxed process than conducting a focused online search, and it gives you a chance to discover other products that might interest you – possibly even at lower prices. Avoid Return Fees. Perhaps you think it doesn’t really matter if the image you get of a product online isn’t perfect. After all, if you open the package and then decide you don’t love it after all, you can always return it. That’s true, but shipping things back can be both pricey and inconvenient, especially for bigger items like rugs. For instance, to return an area rug purchased at Macys.com, you must pack it in its original shipping materials and send it back within 30 days after purchase. 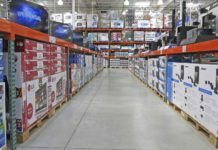 At RugsUSA.com, you have to pay the cost of shipping it back yourself. Avoid Shipping Costs. A couch is a lot heavier than a cushion, and it costs a lot more to have it shipped to your door. Online stores typically charge shipping equal to 10% of the purchase price, which adds up to a hefty sum if you’re buying a whole living-room suite. Brick-and-mortar stores charge delivery fees, too, but online sellers tend to charge higher rates. Plus, when you shop in a store, you can sometimes avoid the delivery charge by hauling the item home yourself. Even if you have to spend $20 to rent a truck to do it, that’s a lot less than a $120 delivery fee. Test for Comfort. While there are ways to avoid or reduce shipping costs when you shop online, there’s one thing you definitely can’t do: test the products for comfort. A couch, chair, or bed doesn’t just need to look good; it also needs to feel good when you sit or lie down on it. The only way to test for that is to go down to the store and try the piece out in person. Avoid Return Fees. It’s especially important to make sure you like your new furniture before you buy, since returning it can be a big, expensive hassle. Some online retailers, such as CB2, require you to ship back any furniture piece you’re not happy with at your own cost. If the store isn’t satisfied with its condition when it arrives, it charges you a restocking fee of 25% of the purchase price. And even if the piece is in perfect condition, you still can’t get a refund for what you originally spent on shipping. Negotiate the Price. 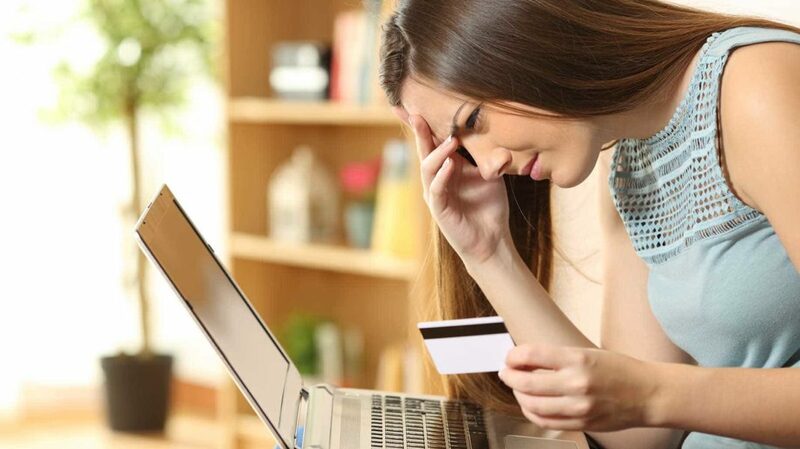 When you shop online, the price on the screen is the price you pay. When you shop in a store, on the other hand, you’re dealing with a real, live salesperson who earns a commission on every sale. This gives them a good reason to be willing to bargain with you on the price or other details, such as shipping costs. This is one way that the Internet can actually help you with furniture shopping: Before you hit the store, go online to check prices for the item you plan to buy. If you can show the sales clerk that there’s a better deal online, you can often persuade them to come down on the price. Finally, don’t forget that the Internet and traditional stores aren’t your only choices when shopping for furniture. There are plenty of other places to buy inexpensive furniture, such as thrift stores, garage sales, estate sales, Craigslist, and auctions. These sources can offer even bigger bargains on furniture than the best Internet sites. Sleep is incredibly important to your health, and the quality of your mattress makes a big difference to how well you sleep. However, this doesn’t mean that simply buying a pricier mattress guarantees a better night’s rest. Mattress comfort is a very personal thing; it depends on a wide variety of factors, such as your height and weight, whether you sleep on your side or your back, how much you move around at night, and so on. That’s why the need to test furniture for comfort is especially crucial when it comes to mattresses. Reading online reviews can give you a general idea of what a mattress feels like, which can help you decide which models you want to look at. However, to know how it feels to you, you have to lie on it yourself. 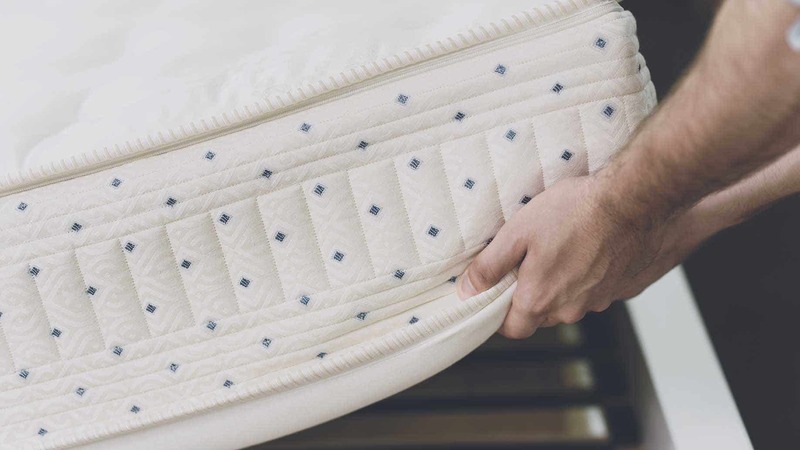 Consumer Reports recommends putting a mattress through its paces before you buy, spending at least five to 10 minutes on each side and on your back (and your stomach, if that’s how you tend to sleep). That should be enough to give you an accurate first impression. The magazine says people who brought home mattresses for a month-long trial usually felt the same about them at the end of the month as they did after the first night. Another perk of shopping in-store is that you can negotiate with the sales clerk for a better price. According to Consumer Reports, there’s more wiggle room in the price of mattresses than there is for most products. A few chains, such as warehouse clubs, charge fixed prices with no haggling allowed. However, at other retailers – especially mattress specialty chains – there’s a lot of leeway. These chains tend to charge huge markups on their products, which means they can drop their prices by 50% or more during sales. These sales are most likely to occur during holiday weekends, such as Memorial Day. However, Consumer Reports says it’s possible to get these sale prices at other times by haggling. If you simply refuse to pay more and are prepared to walk out if you have to, the salesperson will often back down. On top of that, you can negotiate for extras, such as free delivery, free disposal of your old mattress, or bedding accessories thrown in along with the mattress. See It Up Close. Like furnishings, appliances have details that you can’t always see on a screen. For instance, if you’re buying a new refrigerator, seeing it in person lets you check out how sturdy the materials feel and how easy it is to open and close the drawers. You’ll also be able to tell if your hands leave smudges on the finish – something that you’ll never see in a photo of a fridge that’s just been carefully cleaned and polished. A Chance to Ask Questions. When you shop online, you’re on your own as far as comparing models goes. You have to scan all their specs yourself to see how they compare in size, efficiency, and features. In a store, you can ask the salesperson to explain exactly what the difference is between two models that look identical to the naked eye. Less Fine Print. While you’re talking to the sales clerk, you can also get all the details about delivery, installation, return policies, and warranties. If you’re shopping online, you have to comb through the fine print to find this information yourself. If you don’t make that effort, or if you don’t manage to catch all the details, you could end up with an unpleasant surprise, such as having your new fridge dumped on your doorstep with no way to get it into the house. Less Risk. Shipping a big appliance, such as a fridge or a dishwasher, is a risky process. 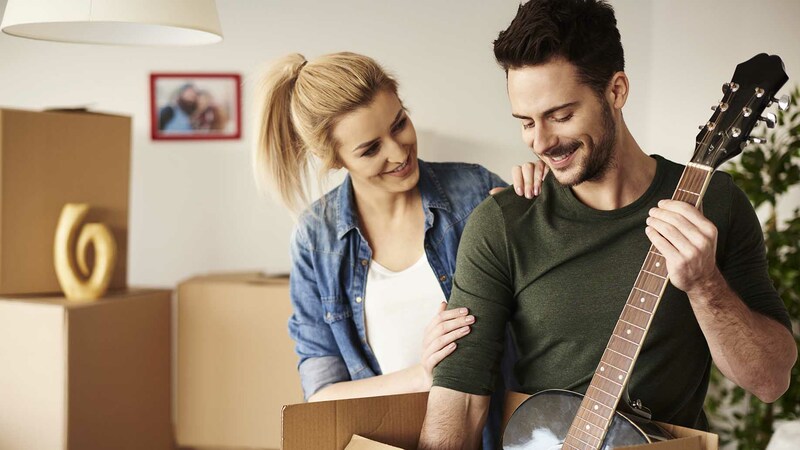 If you open up the box and find your brand-new appliance is damaged, you’ll have to figure out how to get that huge package back to the store for a return, rather than simply sending it back on the truck that brought it. Worse, you might not be able to prove the damage actually occurred in shipping, which means you could be socked with a hefty restocking fee. Buying a car can be a very stressful process. From the minute you walk in the door of the dealership, the salesperson sticks to you like glue, doing everything they can to lure you into signing a contract right then. It’s tempting to just do your car shopping online and avoid all that hassle. However, experts say buying a car without seeing it in person is a big mistake. 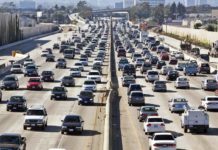 Using the Web to research different car models and prices makes sense, but before you actually settle on a car, you need to get behind the wheel for a test drive. It’s the only way to know for sure how comfortable the car feels, how well it handles, how good the visibility is – even little details like whether you can reach the radio controls without taking your eyes off the road. If you’re buying a used car, you need to do more than just drive it yourself. You should also take it to a trusted mechanic for a thorough checkup. They can spot all the potential problems that you can’t detect in a 10-minute test drive. That way, you won’t risk falling in love with a car that turns out to need thousands of dollars’ worth of maintenance work. Which brings us to another benefit of buying a car in person: If you discover that you’ve landed a lemon, it’s a lot easier to return it. Even though many online car-buying sites are perfectly trustworthy and have good return policies, it’s still a much more complicated process than driving it back to the dealership where you bought it. If you’re a serious musician, you should have serious reservations about buying an instrument online. A high-end musical instrument, such as a Taylor guitar, costs hundreds, if not thousands, of dollars. Before making an investment like that, you need to know how the instrument sounds and how it feels in your hands – and the only way to test that out is to play it for yourself. Relying on the brand name isn’t enough, as tone and playability can vary widely even within trusted brands. Another big problem with buying an instrument online is the risk that the instrument could be damaged during shipping. Shelton, who’s a musician as well as a shopping expert, says in a Kiplinger interview that this has happened to him. Insurance can cover the financial loss, but a truly rare or vintage instrument isn’t easy to replace. However, Shelton admits that this rule about online shopping isn’t as hard-and-fast as some of the others; it depends on the type and quality of the instrument he’s buying. Instruments made of wood vary more in tone, and they’re also more delicate and vulnerable to breakage. So, if you’re buying something like a flute – especially if it’s a low-end student model – the risk matters less. If you find a good value online, it could be worth snapping up. Quality. When you buy groceries online, you assume that your order is being filled with the same food you’d find at your local store. However, that’s not always the case. John Lal, founder of the cash-back website BeFrugal, warns that the produce used to fill online orders isn’t always as fresh as the stuff on store shelves, which has to look its best to attract buyers. Buying online doesn’t give you a chance to check the quality of the food. When you shop in a store, you can smell the peaches to make sure they’re ripe and examine the lettuce to see if it’s crisp. You can also check expiration dates on dairy products and choose the one that will last the longest. You can’t count on the employees who fill your online order to do that for you. Price. Buying groceries online can save you time, but experts say it won’t save you money. Big online retailers, such as Amazon, don’t have the same price advantage when it comes to fresh food that they can offer for other items. A study by Kiplinger found that Amazon’s prices on most food items can’t beat the sale prices at supermarkets or the regular prices at warehouse stores. As for online grocery services like Peapod, they offer a more limited selection of foods than your local store. The best in-store bargains often aren’t available – and on top of that, you pay an extra charge for delivery. Plus, shopping in-store makes it much easier to compare prices and use coupons. Discovery. The final perk of shopping in-store is that it gives you a chance to browse and discover new products. When you shop online, you typically run down a list, clicking on the items you want and putting them into your online cart. By contrast, when you push your cart through the store, you may notice new and interesting products that you haven’t seen or tried before, such as exotic fruits or artisanal jams. This makes store shopping a good way to find new favorites, instead of buying the same staples week after week. Gauge Colors Accurately. As noted above, colors don’t always look the same on a screen as they do in real life. A slight difference in shade isn’t crucial if you’re buying a T-shirt, but it can be when you’re trying to find the cosmetics that best match your complexion. A lipstick that looks like the perfect shade on your smartphone screen might not look as great on your actual lips – and once you’ve opened it, you probably can’t return it. Sample Products. The best way to find out how cosmetics really look and feel on your skin is to try them out in person. 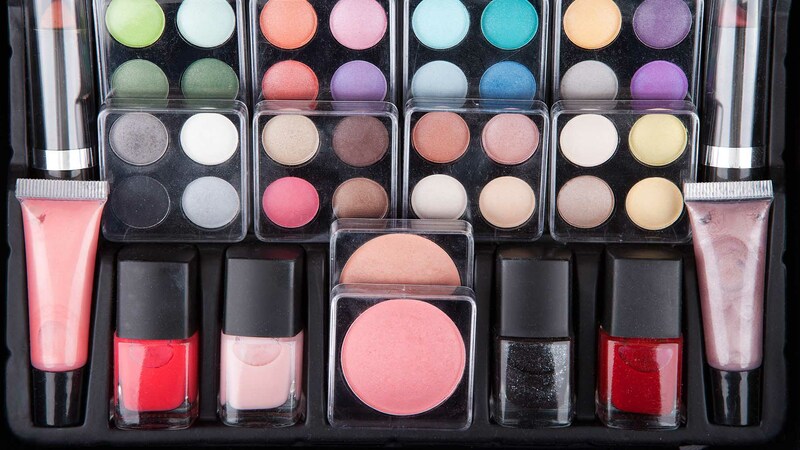 Department stores and specialty makeup stores like Sephora and Ulta offer “testers” of their products, so you can experiment with new products and try different shades. Be careful when using these, though. To avoid spreading germs, always use the disposable applicators the store provides, rather than applying the makeup directly to your skin. Also, only use the samples if there are store employees keeping an eye on them; otherwise, you can’t be sure other shoppers have used them properly. Consult With Salespeople. Beauty-store workers do more than just keep an eye on the makeup samples. They can offer advice on the best products for different skin types and even give in-person tutorials on how to achieve a specific look, such as a smoky eye. For example, you can walk into any Sephora store and get a 15-minute mini makeover or mini facial for free, with no purchase necessary. Use Reward Programs. Many drugstores and specialty beauty shops offer loyalty programs that give you points on every purchase. These programs also give you access to special discounts that are only available to members – and, usually, only in-store. There’s one more thing experts say you should never buy online: anything that’s marked as “final sale.” These closeout items usually aren’t returnable, so if you don’t like your purchase, you’re out of luck. Unless the cost is completely negligible, it’s best to steer clear of these items when you’re on the Web – even for products that are normally best to purchase online. Fortunately, you can get many of the benefits of shopping online without actually clicking the buy button. You can hit the Web to compare products, check prices, read online reviews, and search for coupons. This will help you narrow down your choices and find the best stores to shop in. That way, when you finally head to the store to make your purchase, you’ll know exactly what you want and what you should expect to pay for it. Can you think of anything else you would never buy online?